International uproar followed the shooting death of Cecil the Lion by recreational big-game hunter Walter Palmer on July 1, 2015. 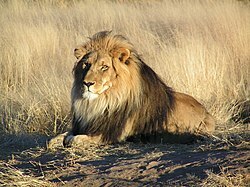 Poaching and habitat destruction are seriously threatening African Lion (Panthera Leo) populations, with the population decreasing by an estimated 30-50% every 20 years in the late half of the 20th century. The current wild population is estimated to be between 16,500 and 47,000, down from over 100,000 in the early 1990s and 400,000 in the 1950s. This majestic animal has been an iconic feature of the savannah for thousands of years, and its decline is a sad testament to humanity’s impact on the natural world and its biodiversity. Below is a map of the current and historical range of the Lion across Africa and parts of Asia.